This labor day weekend, I spent the weekend at the Mackinaw City home of my girlfriend's parents, which is literally right on the tip of the mitten with a gorgeous view of the Mackinaw Bridge. McGulpin Point Lighthouse is a short 1/4 mile walk down the beach from their cottage, and is a great place to start a very beautiful drive down the northwestern coast of Lake Michigan. Starting at McGulpin point is a matter of curiosity moreso than for the driving experience. This lighthouse has only recently been re-opened to the public, so it's a good place to start, and provides some great historical context to the so-called Headlands area through which you pass on your way down through Wilderness State Park and to the coast line. 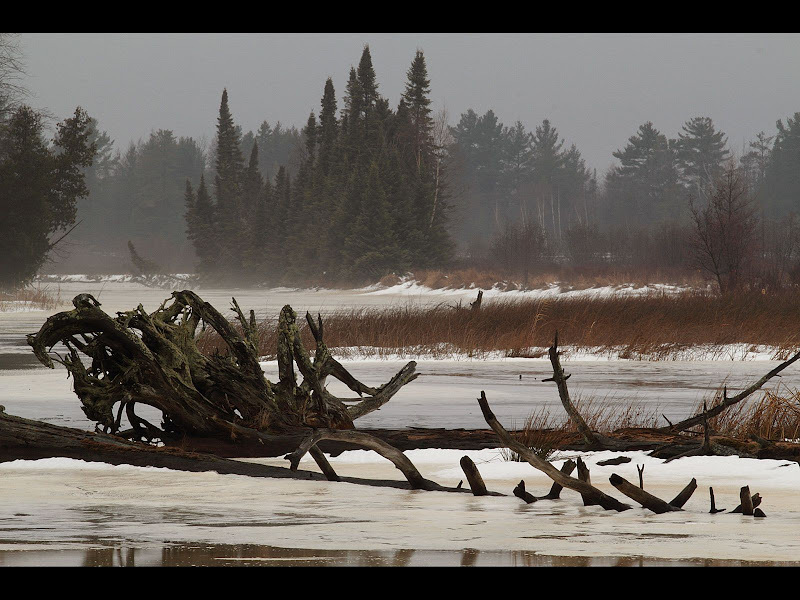 The driving along the first part of the route is not that stimulating, although the scenery is quintessential Northern Lower Peninsula, featuring old farmsteads interspersed between meadows and pine forests. However, when you arrive at the junction of W Lakeview Road and N Lakeshore Drive, this is where things become more interesting from a driving perspective. The narrow road begins winding through a classic northern Michigan woodland, dominated by White Pine and other coniferous species that favor the sandy soils of the old dunes that form this portion of the lower peninsula. Less than a mile down N Lakeshore Drive, you will encounter an excellent beach at the Township Park, with opportunities to swim, hike or otherwise stroll the beach in many miles, both north and south. There are multiple turn outs all along this twisty portion of the road, but it is very lightly traveled and you are quite likely to have the beach almost entirely to yourself. It is an excellent spot for picnic. Further down N Lakeshore Drive, you will encounter the diminutive Cross Village, and there is an excellent eatery there called Legs Inn. The building is unmistakable and impossible to miss! As you proceed south from Cross Village, the road climbs the sand dune bluff until you are several hundred feet above the lake shore, with dazzling glimpses of the big lake flashing by through the tops of pine trees. The road enters a virtual tunnel of trees and becomes very narrow and twisty, hardly wide enough for two cars to pass in several sections! By the time you reach the Good Hart General Store, the road straightens a little, but continues to ride along the crest of the bluff, following the curve of the shoreline back to the south-east as you approach Harbor Springs. This small town has an excellent lighthouse and many good eateries featuring Great Lakes fish and other Michigan specialties like home-made pasties, a sort of meat pie that became the primary food of miners and loggers working the land in the 19th century. Petoskey is a bit more upscale, and both towns have their share of tourist traps. But the views are unmatched, and there are many beautiful old homes to enjoy if you care to meander through some of the neighborhood back streets. You can also stop at Petoskey State Park to make your way to the beach and search for the Agates and Petoskey stones famous to this area. Stone hunting is most productive just after a westerly storm, as new material will be rolled up onto the beaches by winds and waves. About an hour north of the Mackinaw Bridge is Brimley, an excellent state park situated on the shore of Lake Superior at the mouth of the Whitefish Bay, just before it funnels down into the St. Mary's River, the famous river crossing and lock system situated between Ontario and the Upper Peninsula, and connecting the Lake Superior and Lake Huron waterways. 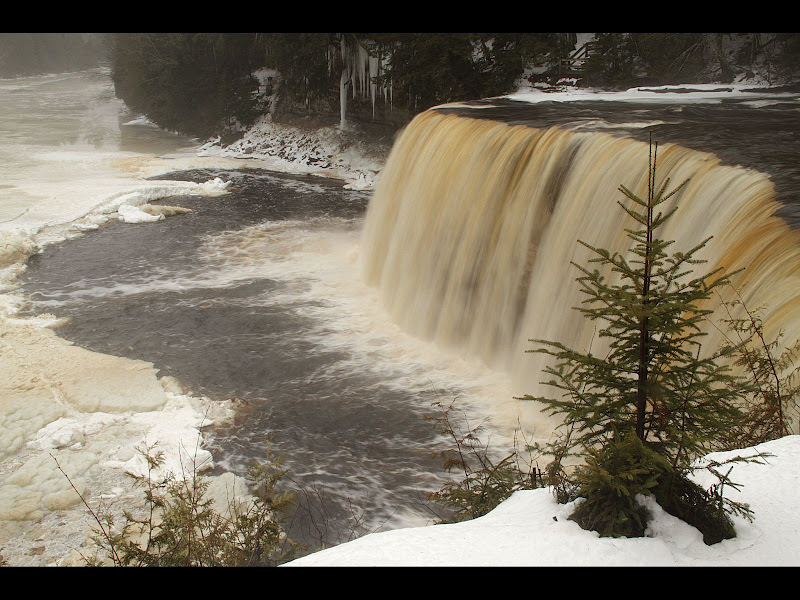 The route from Brimley to one of Michigan's signature features, the Tahquamenon Falls, follows the Superior shoreline, and then winds its way through pine barrens and spruce bogs typical of those that stretch from Ontario to the Arctic Circle. Just to the west of Brimley is the Point Iroquois Lighthouse, marking the entrance to the St. Mary's River. Also nearby is the town of Bay Mills, sharing its name with the nearby Indian Reservation and requisite casino (for those so inclined). West from Bay Mills, the lakeshore drive hugs the Superior coast line, in this area fairly low and innocuous despite the treacherous waters of Whitefish Bay beyond. This portion of the road is a designated national scenic byway, passing through a large portion of the Hiawatha National Forest. 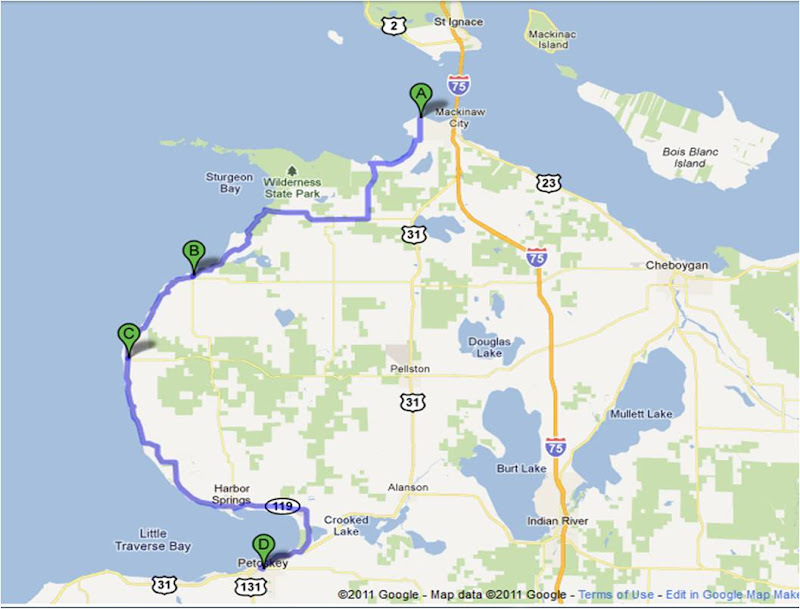 After nearly 30 miles of coast line driving, Lakeshore Drive intersects with M-123. 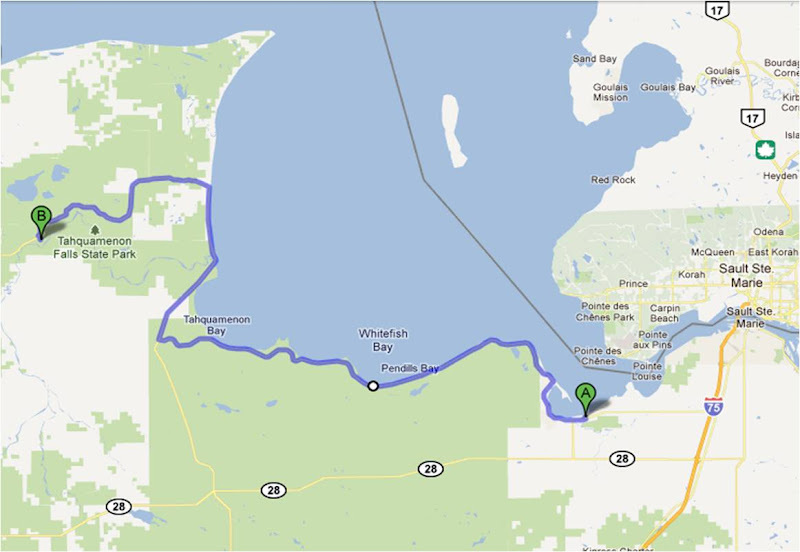 Continuing north on M-123, you will encounter the mouth of the Tahquamenon River where it dumps into Whitefish Bay. There is an excellent riverside state campground here, along with a boat launch and several picnic areas. This location is one of my favorites in all of Michigan, the winding, tanin-stained Tahquamenon meandering through its marshy, spruce-lined banks until it feeds the deepest, coldest, and most dangerous of the Great Lakes. Another 5 miles or so north of the river's mouth is the one-light town of Paradise, where a few decent eateries...including The Fish House. M-123 makes a right turn at the main intersection in town...but if you want a real taste of Lake Superior, you can continue north to Whitefish Point along the aptly named N Whitefish Point Rd. At the terminus of this two lane highway is the world-renowned Great Lakes Shipwreck Museum where the sailors of the SS Edmund Fitzgerald and many other shipwrecks are eulogized. 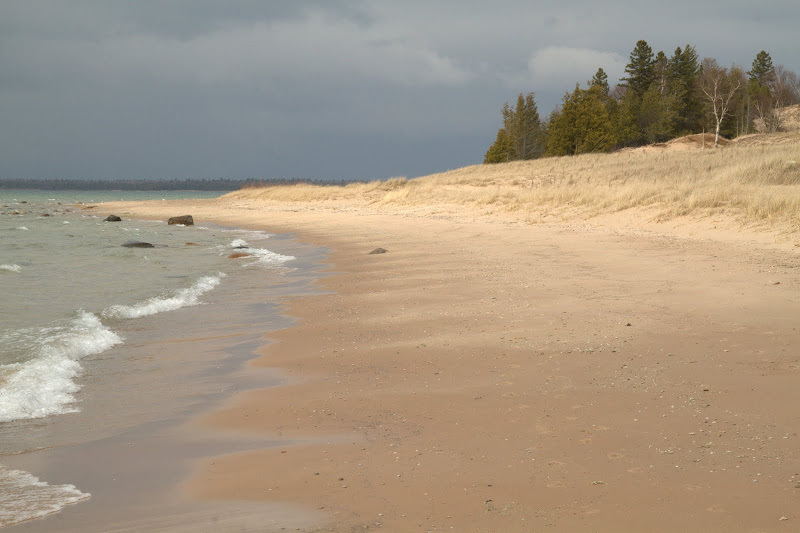 There is an excellent lighthouse and several restored buildings that are part of the museum, along with a bird observatory, as Whitefish Point is a key stopping point for many species of raptors along their spring and fall migration routes to and from northern latitudes. Back to 123, this is where the fun really begins from a driving perspective. This excellent stretch of smooth two-lane black top begins to twist and turn with gentle rises through the Hiawatha National Forest as you approach first the lower, then the upper Tahquamenon Falls, each accessible by a short detour into the adjoining state park. This wonderful drive along 123 is only about 15 miles from Paradise to the Upper Falls, but it is a favorite route for motorcyclists, so take caution on blind curves. Of course, the falls are not to be missed, as they are one of the largest falls east of the Mississippi, surpassed only by Niagara (NY) and Great Falls (VA) in terms of drop and volume.